Scanning through the pertinent FCC Rules, dockets, memoranda and opinions, a dizzying array of instructions and guidelines can be found, pros and cons. Question: which should be meticulously followed by the survey engineer, which can be neglected? The testing and reporting recommendations of this Technical Bulletin are based on field experience, gained through the more than one hundred must-carry tests and measurements conducted in the NEW YORK-PHILADLEPHIA metropolitan area. CATV systems are required to carry all local broadcast networks as well as educational/religious/independent TV stations in their market area, regardless of programming, as long as the stations meet the Commission’s signal intensity criteria. The stations must be carried on the channel line-up despite the fact that subscribers have not expressed interest in their carriage. Survey engineers as well as the non-technical staff may avoid unnecessary disputes over signal level measurements by analyzing the pertinent reporting rules, clarifying the issues, filling occasional gaps in the guidelines. The make and model of the equipment applied, age and the calibration date of the test instrumentation. A description of the equipment’s characteristics, such as antenna ranges and radiation patterns. Height of the antenna above ground, and a statement that the antenna was properly oriented. Weather conditions and time of the day when the test was done. Conduct multiple signal quality tests to ensure accurate results and, in turn, provide the testing method information to the affected TV station when there is a dispute over signal level measurements. A. Manufacturer and model of equipment, date of calibration. These are standard, well understood requirements, easy to follow in the Report. “Age of equipment”. Isn’t this a silly question? Consider the age of the test instrument. Since we assume it was properly calibrated, does it make any difference that the instrument was brand new, three years or five years old? In case it’s five years old should 2 dB deducted from the results? Since the test antenna and the antenna downlead form an essential part of the measuring system, should the age of the antenna and the coaxial cable be reported as well? Any documentation available when the antenna and cable were produced, or how long they were in the stockroom before sold or delivered to the system? B. Another interesting must-carry reporting requirement is the characteristics of the equipment used, such as antenna ranges and radiation patterns. This consulting engineer, the author of ”THE CATV ENGINEER’S ANTENNA HANDBOOK” is somewhat puzzled about the expression “antenna ranges”. Do they refer to the antenna test-range, where that specific model was tested,-- which makes no sense. Or considering the frequency range of the antenna, which makes more sense. Focusing our attention on the subject of antenna radiation patterns, let’s assume that the first side-lobes are not the customary 16 dB but only 12 db down. Or the Front/Back Ratio is 5 dB less than expected. Does it mean that the test results are not valid any more? What are the criteria of acceptable and non-acceptable patterns? Common sense dictates that the antenna gain, in dB over a half wavelength dipole, would be a more meaningful specification. That should be incorporated into the reporting requirement. Attaching to the Report the (true) radiation pattern of the antenna? Not an easy task, and in case the antenna was purchased from Radio Shack, it is impossible to acquire it at all. C. “Height of the antenna above ground”. Not a very difficult reporting requirement to comply with, and it is a solid testing parameter. “A statement that the antenna was properly oriented”. This requirement falls in the same category as the past security rules of the FAA: every passenger checking in at the airline counter had to make a statement that the luggage was packed by him/her and nobody approached him/her to accept additional material. Did the FAA really expected that a prospective terrorist will make a negative statement? Along the same lines, does the Commission expect to receive a statement that the survey engineer was negligent in orienting the test antenna? After many articles and anecdotes in the press the FAA, somewhat reluctantly, abandoned these questions. Can we expect similar reaction from the Commission that the antenna was of course properly oriented. D. “Weather conditions”. The temperature during the testing dropped to 24º F and the wind, NW, was measured as 16 MPH. Because the temperature was 44 degrees below the ideal 68º F, and the wind 6 MPH stronger than predicted, does it mean that the test results are not valid? Or because there was light snow in the first half of the day, the obtained readings should be disqualified? “Time of the day”. No problem with the recording of the time of the day. But is there a hidden message that certain testing periods are unacceptable for the Commission? E. “Multiple signal intensity testing”. It is not unreasonable to request multiple measurements, but the guidelines for the number of tests, as well as the testing period should be firm and reasonable. If the on-site tests confirm the total absence of the desired video carrier, there is no point to continue the testing for four (4) hours or longer. When the first measurement produced a level of -25 dBmV, do they expect the level to rise (by some miracle) to +1 dBmV or higher within the next thirty minutes? At the other end of the spectrum, when the received signal level fails to reach the prescribed minimum, but the difference is 3 dB or less, the every half-hour re-testing is not unacceptable, it is highly recommended. 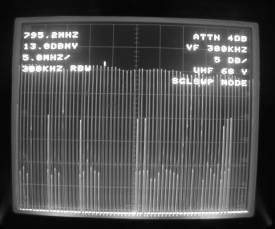 And this is also the case when photographs, taken from the screen of the spectrum analyzer become really helpful to substantiate any variation in the field intensity. Insertion loss of the antenna downlead. The minimum signal intensity requirement, which is -45 dBm for UHF channels, is the signal level at the antenna input terminals. 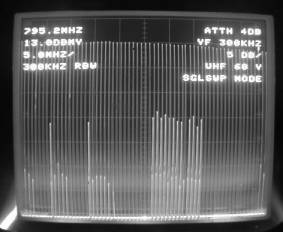 On the other hand, the signal level measurements were performed at the end of the antenna downlead. Consequently, to re-calculate the measured video carrier to the antenna input the insertion loss of the cable has to be measured precisely. Testing, with the aid of the UHF sweep generator and the TEKTRONIX Model 2710 spectrum analyzer as the measuring instrument, is convenient and a highly efficient method. The difference between the levels displayed on the left and right screen produced the insertion loss in dB, with 0.2 dB accuracy. The rotor-mounted antenna was installed at the prescribed height. It was properly oriented toward the TV station. 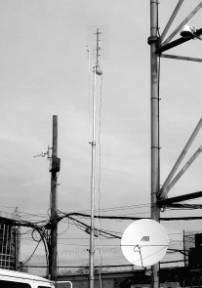 There were no obstacles near the antenna impairing line-of-sight conditions. 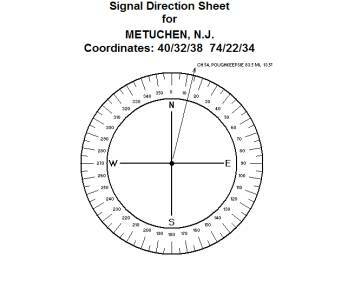 A computer generated signal direction sheet, displaying the direction (.1º accuracy) and distance (0.1 mile accuracy) of the TV station, will assist the survey engineer in making a proper antenna orientation. If the test results meet or exceed the Commission’s signal level requirements of -45 dBm on UHF and/or -49 dBm for VHF transmissions, the station is entitled to cable carriage. The -45 dBm or -49 dBm signal level is referenced to the input terminals of the antenna. Everything else is adjunct, making the Testing Report an interesting and informative reading, but not materially affecting the Commission’s minimum must-carry signal intensity requirements.